Dan Heching as Sammy. Mugged. Photo by Robert Cole. 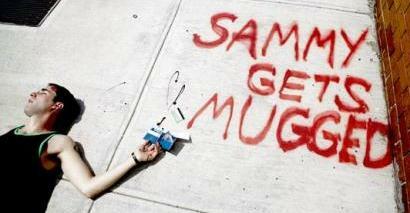 In Sammy Gets Mugged! playwright and performer Dan Heching relives for us directly, fourth wall immediately and repeatedly broken throughout this theatrical adventure, a Parisian mugging. Or he relives for us a series of drafts of an experience dreamed up by a writer to give himself something about which to write (in the play, outside the play, in short — the play). While we hear Edith Piaf (or someone tonally similar) as house music as we enter the theatre and images of the Parisian locations of the inspirational mugging event (I learn this fact from the press pack) are pictured on the sides of storage cubes from which props are removed as necessary — it is in fact unclear where the events of the play are taking place. All characters speak in English, in their native accents, and no reference is made to specific Parisian locales. Where are we? The playwright and the press notes instruct us that this is a musing on memory. Able actors grapple with the material and create some delicate and sometimes funny moments. It remains for us as audience members to judge whether these musings function well in a theatrical setting. Three characters walk through their own versions of scenes solo, in dyads, and occasionally as trios (primarily in one character’s imagination). Sammy (Dan Heching), his mugger who never receives a name (Patrick Byas) and a passer-by who may have witnessed the interaction Rue Felicite (Stephanie Pope Caffey). In fact, the characters never speak with one another in a way we are able as audience members to relate, in the moment in any scene for any length of time, because we are so early alerted to the fact that we will indeed be shown the scenes multiple times, with difference angles, from different character perspectives. We are in essence presented with shards of theatrical time. In Sammy’s perhaps imagined later visit to the perhaps imagined mugging event (also illustrated several different ways), we do in fact have conversations between characters in this imagined “real time.” Yet we don’t stay there for long. We are shown different versions of sequences so many times and have been so thoroughly instructed that it no one true version of events is being presented and that the events in question may ever have happened at all — that when Sammy says at one point directly to the audience late in the play, “They don’t want to see it again,” there were groans of recognition and agreement with that statement in my audience as if to say: you’re right. Please stop. The playwright is musing on the concept of memory and choices and fiction and the creation of art. I understand from the press pack that he may be translating this idea to film (where these musings may work very well). What happens with all of these goals in this particular constellation of repeated riffs as live theatre on the possibility of a theme — is the feeling of watching a series of improvs without an ending, and a lack of rootedness in place that untethers me as an audience member before the show concludes.